January 3, 2013. It was in November of last year, when I was making an unofficial guide to Paul Noble’s Nobson Newtown, that I realised that there was another visual artist’s long-term project - again dominated by an ostensibly deserted, but thoroughly lived-in place - that I wanted to engage with at length: George Shaw’s Tile Hill. I should try and get across how strange this felt. There I was, harvesting a crop that I hadn’t known had been growing inside my head since the late nineties. 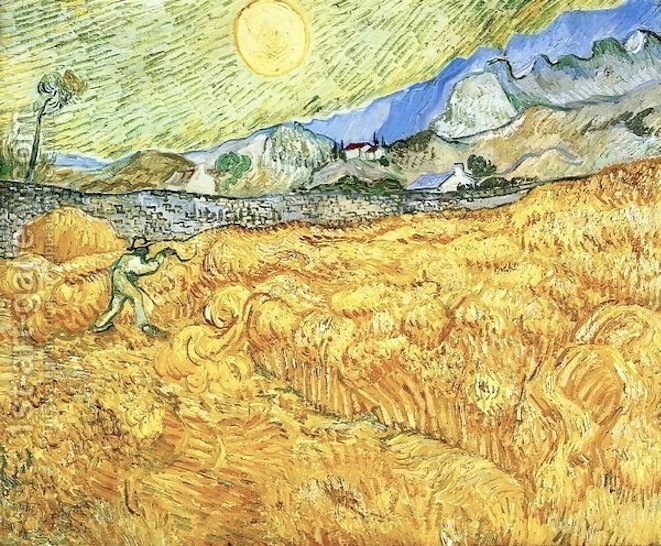 And, as I was cheerfully having a drink at the end of a long day’s scything, I looked up and saw that in the very next field there was another crop, just as spectacularly ripe after the best part of fifteen years’ growth, which would want bringing in straight after the first. Christ, it ain’t easy being an art farmer, working alone and in other people’s fields. As with Paul Noble’s drawings, I first came across George Shaw’s paintings while haunting the galleries of London’s East End. As with Nobson Newtown, I convinced Keith Patrick of contemporary visual arts to commission a feature about the work. And so it was that in the summer of 1999 I met George Shaw. I’ll say more about that on subsequent pages, here I want to highlight that following our meeting, George sent me some material through the post. Again, I’ll say something about the pamphlets that were included at the right time, but for now I just need to say that the package also contained two postcards that I’ve scanned and uploaded below. The first of these postcards was an example of the landscape paintings, meticulously rendered in Humbrol enamel paints, that I’d been so taken with when I’d seen them hanging on the walls of the Anthony Wilkinson Gallery. The painting was called The path in, and as far as I was concerned that’s exactly what it was. The path into George Shaw’s work. I still think of it as that. However, I now think there are several paths into Shaw’s ouevre and the more of them that are trodden, the more the viewer gets out of the work. I didn’t give this postcard much thought back then, I suppose because it made me feel uncomfortable. I’d been as guilty as anyone of using the objectifying male gaze, but this seemed like a particularly dehumanising example. A woman reduced to being an object with a bum hole. Well, no, the braiding of a few strands of head hair, that single detail, suggested there may be a modicum of sympathy between male artist and female ‘sitter’. But were the words of the title: ‘God only knows what I’d be without you’, intended to be ironically spoken by the man - either in his role as artist or mate - or an abject utterance of the woman? All three, possibly. A few years later, when the Ikon Gallery published the George Shaw catalogue What I did This Summer, reproducing more drawings (with intense, self-referential texts) from Shaw’s ‘God Only Knows’ series, I noticed the pointing finger again and associated it with the hand of God as painted by Michelangelo on the ceiling of the Sistine Chapel, creating Adam in his own image. The word-infested ‘God Only Knows’ drawings in the Ikon catalogue were dated 1997 and must have represented a strand of work Shaw had been making while studying for his MA at the Royal College, either simultaneous with or just before the start of the Tile Hill paintings. Michelangelo. The Creation of Adam. 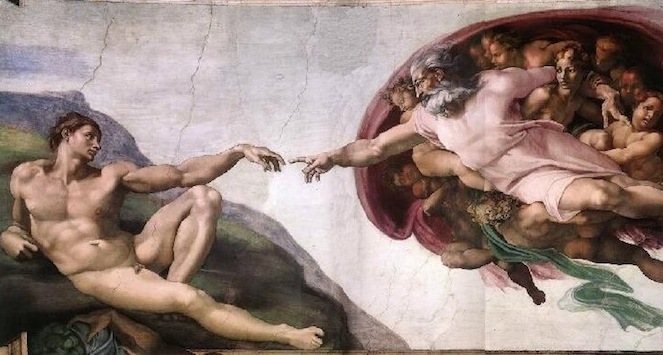 (Detail from ceiling of Sistine Chapel.) 1508-1512. In 2011, when Shaw had a solo show at the Baltic in Gateshead, a video was made of the artist walking around the exhibition. He stops at one small picture, the one reproduced below, which is called No. 57, the first of the Tile Hill series of paintings rendered in Humbrol enamel. 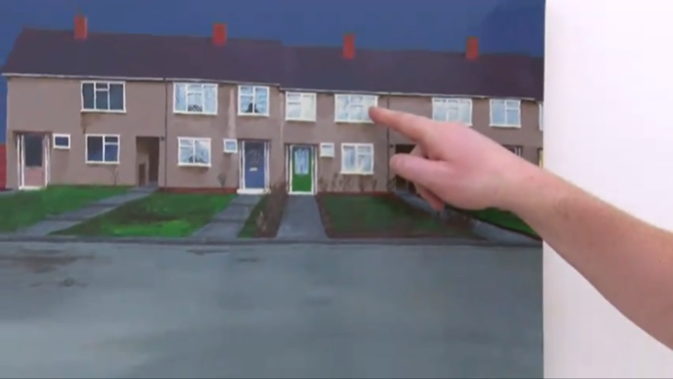 The painting is of the house and street George was brought up in, in a post-war housing estate on the west side of Coventry. The room he’s pointing to upstairs at number 57 was his bedroom as an adolescent. Oh yes, another path in. Shaw mentions in the video that when he began to paint the first pictures in the ongoing Tile Hill series, the work was written off by fellow students and lecturers at the Royal College as being sentimental. (In dramatic contrast with the ‘God Only Knows’ series, one can see why the differences in tone and subject were remarked upon.) Standing in the Baltic in 2011, captured for posterity by video, George confidently asserts his own view: that the paintings represent his attempt at being a human being. This page and those that follow are also part of my humble (twinned with Humbrol?) attempt at being a human being. In other words, I too am hoping to tickle a fancy or two. 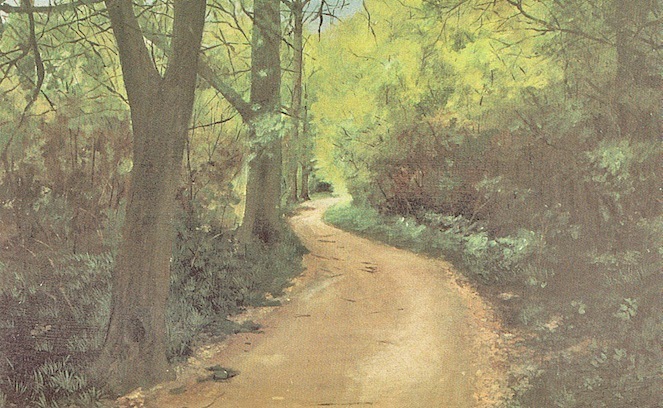 Acknowledgment: The images of George Shaw’s works on this site are copyright the artist. Many of them appear courtesy of Wilkinson Gallery, photography by Peter White.